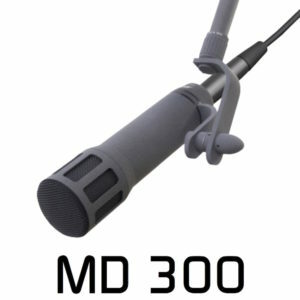 The MD 300 is a rugged cardioid dynamic microphone suitable for “on air” radio broadcast as a presenter (or guest) microphone. It is also excellent for use on stage or in a studio for instrumental pick-up. accurate resolution at high frequencies and a well-balanced low-frequency transmission. 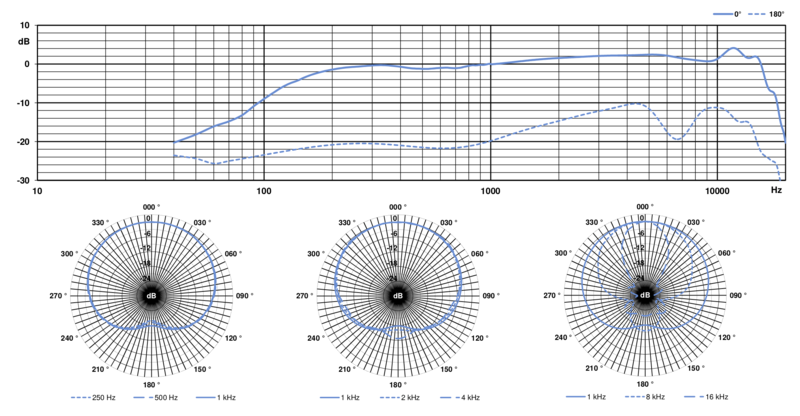 It is insensitive to movements of the recorded sound source thanks to the cardioid polar pattern. The MD 300 is useful as close-talking microphone for announcers of broadcasting services as well as for high-quality recordings of vocalists and instrumental soloists during live performances. A dynamic capsule with a cardioid polar pattern is inserted in the MD 300 as sound transducer. The frequency response has been optimised for low recording distances with an accentuation of approximately 2 dB between 2 kHz and 8kHz to raise the speech and high-frequency presence. The change of the low end frequency response caused by the proximity effect is well-balanced without a very strong overemphasis at small microphone distances. The sound transducer of the MD300 is a moving-coil one. The microphone is connected by a standard 3-pin XLR-male plug with a symmetrical connection assignment. Because of the balanced low-impedance output, the MD300 can be used with longer cable lengths with negligible distortion. The polarity of the microphone is in accordance with DIN 60268-4. The housing of the microphone is equipped with an integrated internal thread at the plug side that allows fixing elastic or inflexible holders, which are available as accessories. This allows using the microphone with studio “Anglepoise®” type microphone arms or stand mountings and also as handheld microphone if needed. The capsule is mounted elastically in the housing to attenuate structure-borne sounds and impulses. If a higher attenuation of such influences is required, it can be achieved by using elastic holders and suspensions, which are available as accessories. Because of the weight of 330 g (without accessories), the MD 300 can be used for longer periods as handheld microphone with negligible distortion. The Rugged dark grey Nextel® coating means that the microphone is non-reflective which meansd that it is unobtrusive should there be cameras in the radio studio (which seems to be very popular nowadays). The Rycote/Gefell G-USM “Lyre” suspension is also highly suitable for this microphone.